Brandboom Connect allows you to reach new Buyers in the system, recommending you matches based on your interactions on the platform and Trade Show preferences. For more information, see How are Connect recommendations generated? On the Connect page, you will see a list of up to several hundred Recommendations for you to take action on. If you Propose or Skip, they will be replaced with a new one the next day, if a new recommendation is available. Otherwise, they will remain in your list. Skip - Let the Recommendation Engine know if the Buyer is "Already a Customer" or "Not a Good Match"
If you choose to Propose to a buyer, you will be asked to choose a presentation from your showroom to send to them. Remember, if the buyer opens your presentation, your credit card will automatically be charged on your next Connect billing date. Since this is your first contact with the buyer, we recommend building specific presentations that help you introduce your brand. The proposal will be seen as "[Showroom Name] | [Presentation Name]" on the Buyer side. See Send a Proposal for more info. You only get charged for premium matches that get opened. Premium Matches are matches that we predict to have a higher chance of engaging with your products. Free Matches help you generate new activity before we can determine which buyers would be a better fit. In the right hand panel, you will see an estimate of expected charges, based on the number of sent proposals and the Open Rate of proposals in our system. Your cost may be more or less, depending on how many of your proposals are opened. You only get charged when buyers open your proposal. An active credit card must be kept on file to use Connect. Your card will be charged once you accumulate $50 in charges or every 7 days, whichever comes first. The buyer will see your proposal in 2 ways: in an email notification and as an entry in their Proposals List in their Buyer page. If they click and view the presentation, the charges will be added to your account to be charged on the next billing date. Otherwise, if the buyer doesn't open within 30 days, you will not be charged for that proposal. Sometimes the Buyer may be interested in seeing your products but not necessarily ready to place an order. Once you've made the connection, you can reach out to the Buyer to follow up! If you've made a mistake or changed your mind about sending a proposal, you can Undo it if it hasn't been sent and have your credits returned, or Recall it after it's been sent to prevent the Buyer from accessing it further. See Undo or Recall a Proposal for more info. 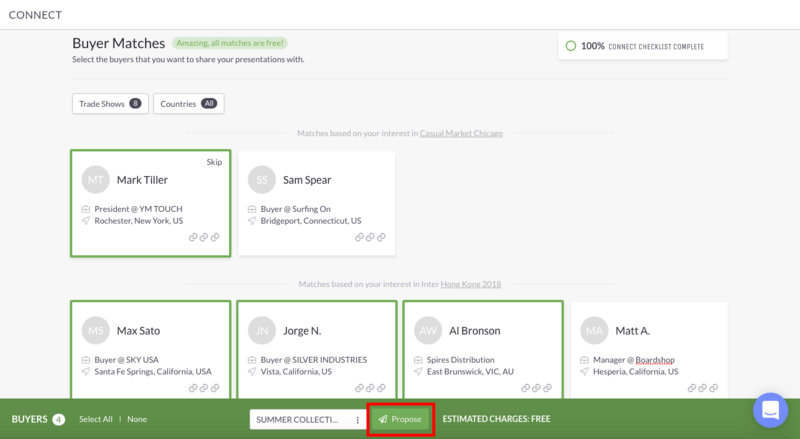 Track your Connect activity to see which Buyers have viewed your Proposals and take additional actions if needed. See Proposal History for more info.